While a variety of male turf horses have stepped up to win Grade 1 races this year, only Heart to Heart took two races in 2018 at the top level — and that one didn’t run in the Breeders’ Cup. So is this the year a different sort of contender wins the Eclipse Award? “That’s interesting,” said Brian Trump, racing manager for Rockingham Ranch, which won the Breeders’ Cup Sprint for a second straight year with Stormy Liberal. Saturday’s victory at Churchill Downs marked Stormy Liberal’s fourth in a row to close his 6-year-old season. Aside from his off-the-board finish in Belmont Park’s Jaipur Invitational (G2), the son of Stormy Atlantic hasn’t missed the exacta in seven starts in 2018. Trump said connections had considered Stormy Liberal as a finalist for Champion Sprinter, the Eclipse Award that will in all likelihood go to another Rockingham Ranch runner, Roy H. But to be turf champ is a new consideration. Stormy Liberal also leads the HorseRacingNation.com Division Rankings for turf runners compiled by columnist Chip Gehrke, who wrote this week that “outside the box thinking has to be considered here in a division that is a mess.” So there, perhaps, is at least one vote. A gelding, Stormy Liberal will campaign in 2019. The end of season goal could shift internationally with The Everest, a weight for age turf sprint, worth $13 million Australian. “I think that we would consider it. It really comes down to how the horse is doing at the time,” Trump said. 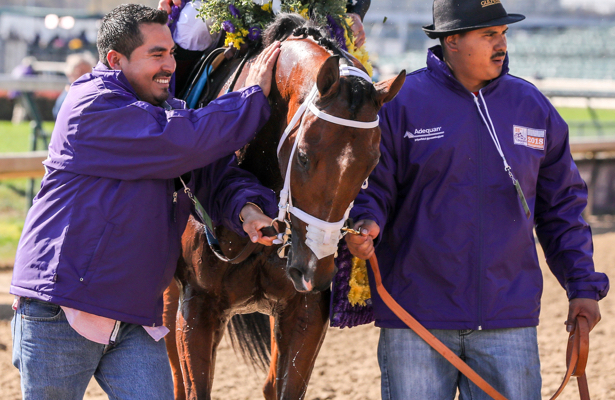 “He’s been a very resilient horse for us, and he’s getting better at traveling. First, Stormy Liberal could get another shot in the Al Quoz Sprint (G1) on Dubai World Cup night. Roy H, another trained by Peter Miller, will target a return trip to Meydan for the Dubai Golden Shaheen (G1) and should go through a similar campaign as this year.